Because sometimes it's okay to go a little nuts. Melt the chocolatechocolate in the microwave at 30 second intervals, stirring each time, until melted, then dip the rim of your glass in the melted chocolate then into the chopped chocolate nuts. Fill your cocktail shaker with ice, add the ingredients and shake until chilled. Strain into a chilled glass and enjoy. 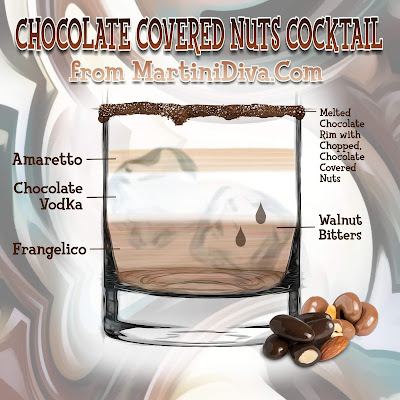 Check out the rest of my Chocolate Cocktails too. National Chocolate Covered Nuts Day is February 25th.